That was a message conveyed Friday by Scott Deal, CEO of Fort Pierce-based Maverick Boat Group during a celebration for the ground breaking of a new boat building facility on St. Lucie Boulevard. The 106,000 square foot facility will house the construction of MBG’s Cobia line of boats, the top-selling center console boat in the country, according to Deal. 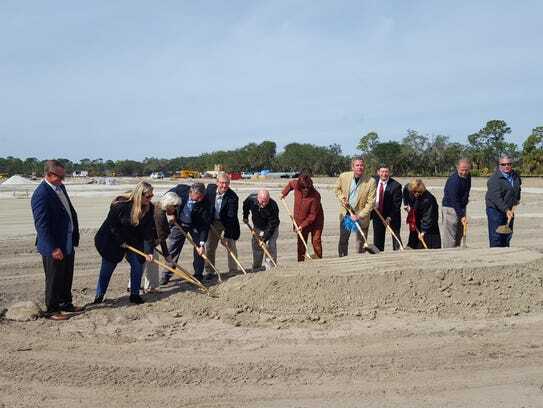 When construction is completed later this year, the company will have added more than 100 new jobs in St. Lucie County. Jim Leffew, vice president of manufacturing with MBG, said within the first year, the company expects to roll off its assembly line more than 1,500 new boats destined for boating markets far and wide, generating over $100 million in sales. In order to do that, Leffew said the company will likely need to hire an additional 120-150 employees. It already employs 287 at its 66,000 square foot facility located about a half mile from the site of where Cobias will soon be built. Friday’s groundbreaking was significant on several levels. Maverick Boat Group is not one of those companies used to tooting its own horn. For 33 years, it has quietly let its product lines do that job, and quite effectively, I might add. Since first settling in St. Lucie County in the late 1980s, soon after brothers Scott and Troy Deal bought six fiberglass molds for $12,000, the business has expanded into four of the nation’s most recognizable and best selling boating brands — Maverick, Hewes, Pathfinder and Cobia. Each is synonymous among recreational anglers in the class of high performance, technically designed specialized fishing vessels crafted by anglers. Good business means good benefits for the community it operates in. Last year, the St. Lucie County Board of County Commissioners working in concert with the Economic Development Council of St. Lucie County approved a $210,000 economic package that will aid Maverick Boat Group in its $6.7 million investment in the new boat building facility. One important part of the package is that Maverick Boat Group must create 100 jobs in two years. That will not be a problem, Leffew said. The company will produce three boats per day and 15 per week and will need at least 8-10 people per boat to accomplish that goal, and meet dealer network and customer demand. And these will be good quality jobs, Leffew said. Leffew said the job market in St. Lucie County is beginning to shift. “We’ve long been known as an agricultural community, and that’s great, but we are becoming a hub for marine manufacturing and we need to embrace that and exploit it, and we’re here to help,” he said. Leffew explained that a bustling boat manufacturing plant also buoys scores of small businesses in the area which also serve the marine community and supply parts for the new boats. “There’s a multiplier effect and it helps raise the standard of living,” he said. The strong economy for marine businesses has been growing since the lending crisis of 2009. It has been so strong in the past three years that other boatbuilding companies are experiencing similar growth. Literally two doors down the street from where Cobia’s new plant will be, Pursuit Boats is also undergoing an expansion to meet its sales demand. In December, the county awarded Pursuit a package worth a little under $50,000 to create 30 jobs with a $2.1 million, 14,000 square foot plant expansion project. This week, Boston Whaler celebrated its own groundbreaking expanding to an additional 60 acres next door to its plant in Edgewater, Fla. in Volusia County. Literally in the Fort Pierce industrial park within a golf swing of Maverick Boat Group’s existing facility are strong boating brands Bluewater Sportfishing Boats and Billfish Boatworks, also enjoying great success and growth. All this came while news this week from a leading marine industry economic analyst indicated that more than 263,000 boats were sold nationwide in 2017, an increase of more than four percent over sales in 2016. Once all states report their sales figures, it is expected that 269,000 boats were sold last year, only the second year where more than 250,000 boats were sold in the U.S. But there are two more important pieces to the “boating is good business” puzzle, Deal said. Deal introduced one of his guests in attendance — Erik Eikenberg, CEO of the Everglades Foundation. Deal said Eikenberg understands why clean water is worth fighting for.